This photo more or less sums up how I spend the month of December. This year I baked 22 different types of cookies. If you are on my Christmas list, this is what you get. A couple of friends came over to help decorate the sugar cookies. They spent hours making them look lovely. My style is to stick googly eyes and mustaches on everything although I did take some time to make a gingerbread Cyclops and goddess Kali. I have received very few lessons to review during the month of December. I think things will pick up now that the holidays are over. The tip this week is very self serving (yet again). I am doing a pair of knee high socks for the summer issue of Cast On. The pattern is a lacy rib. The difficulty in designing knee highs is how to incorporate the stitch pattern into the calf shaping. 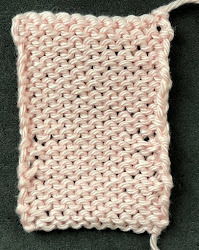 I wanted to increase two stitches in a column of purl stitches. The best way to do this is with paired lifted increases. These aren't the same as a double increase as they are worked in two stitches next to each other. I've used this technique before in designs I have done (Medusa Coat &Medusa Skirt). I've marked the location of the increases with arrows. At the bottom I worked a left slanting lifted increase purlwise and then a right slanting lifted increase purlwise. The slant isn't as important when you are working these increases purlwise. At the top I worked a left slanting increase knitwise and then a right slanting increase. When you work the knit version the slant is important. The photo shows the RS of this work. Salon will be on Sunday from 2-4pm. I will be driving to the Louisville airport. We are stopping by at the Kentucky Historical Society museum. They have a special exhibit of memorabilia from the movie White Christmas. It looks interesting. I finished up all of my holiday knitting before Christmas but in my haste to ship everything off, I didn't get photos. I got the yarn from Miss Babs for one of the projects I am doing for Cast On. THe yarn from Madelinetosh is scheduled to arrive Monday. I haven't heard when the Anzula yarn is shipping. Here is a closeup of the sock. I've got a bit to go but I should finish it up today or tomorrow. I must have ripped this thing out 20 times. I tend to do this when I am not on a tight deadline! Beautiful color and a great looking pattern! I found your interesting instructions for Kitchener stitch using knitting needles. It makes a lot of sense as I always messed up using a tapestry needle! Thanks again for your great helps on Utube and Ravelry.